Pro-government media, also known as pool media, have continued to play their mouthpiece role in the last two months. They portrayed any developments in such a way so that they can direct public perception on par with President Erdogan’s political agenda. There were many other news pieces manipulating public perception towards the West in line with Erdogan’s agenda, some of which can be found below. Turkish police detained 9 human rights activists during a digital security and information management workshop in Büyükada, Istanbul. Attendees of the workshop including Idil Eser, Director of Amnesty International Turkey smeared by pro-gov. 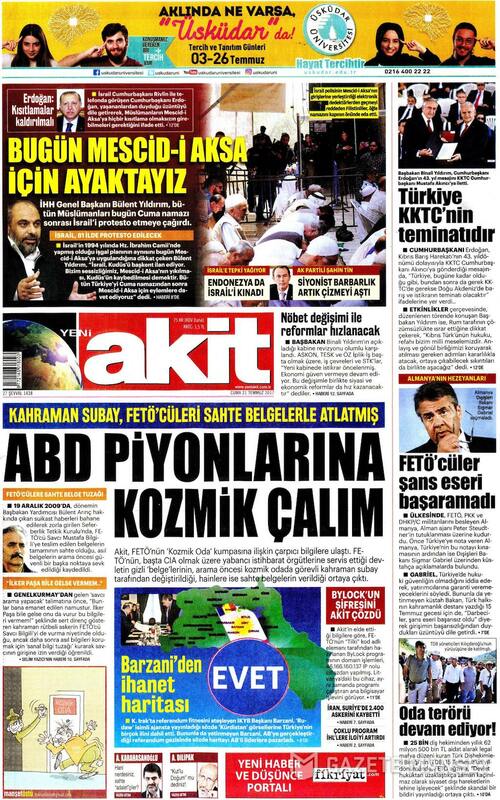 media as ‘agents.’ Pro-government A Haber reported the news with Istanbul’da Ajan Avi, ‘Agent Hunt in Istanbul’. 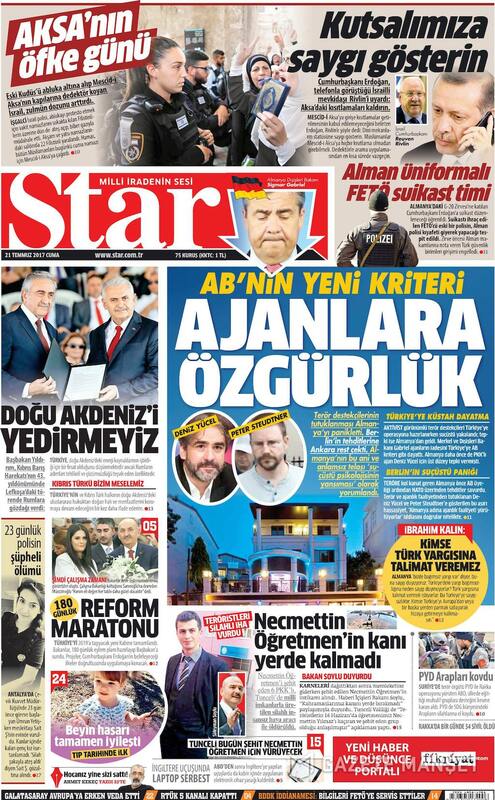 Pro-govt Aksam daily (below the front page) came out with the headline, ‘Their Mastermind is Agent Dundar’ on 21 July. The daily claims that the human rights activists arrested in Buyukada are agents, and that Can Dundar, the journalist targeted by Erdogan as a result of his news piece on ‘MIT (Turkish intelligence) trucks’, is an agent supporting them. Dundar is currently in Germany. Erdogan and the Turkish government blame Germany for sheltering dissidents who are labeled as terrorists. Furthermore, the news piece includes the sub-heading, ‘The Germans Went Mad’, referring to the reaction of the German government to the arrests in Turkey. The Star daily was released with the below headline, ‘the new EU criteria: freedom to agents’. Calling the international public’s critical statements regarding the arrests ‘ An Insolent Imposition on Turkey’, the daily argued that Turkey challenged all impositions. Sabah Daily came out with the headline (below), ‘Terrorist Shelter, two-faced, Insolent’, referring to Germany. The daily referred to the statements of German Foreign Affairs Minister Gabriel with the words, ‘He Threatened Turkey with Sanctions’. Blaming Germany for ‘sheltering terrorists’, the Sabah Daily added that Turkey strongly warned Germany. 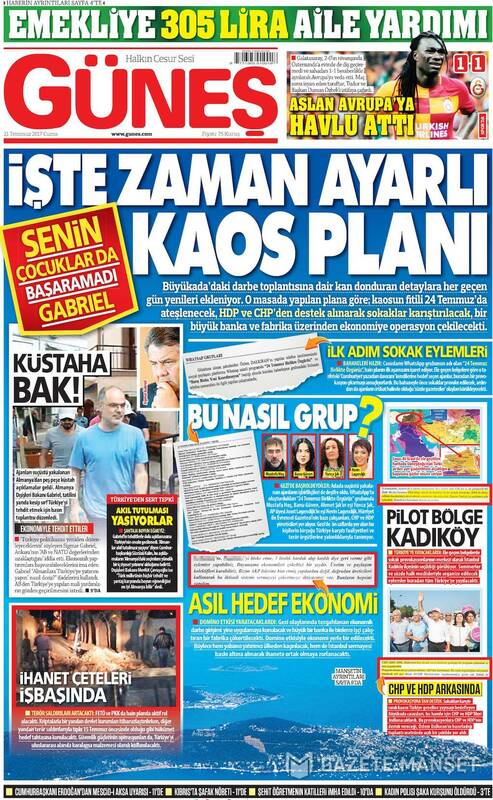 Gunes Daily claimed from its front page (below) that those attending the meeting in Buyukada were planning street protests to throw Turkey into chaos, were preparing to destroy Turkish economy, and that they were discussing the details of a ‘chaos operation’ they were planning to start on 24th of July. Gunes daily also claimed that CHP and HDP, two opposition parties, were also going to support this ‘team’ in Buyukada in their chaos operation scheme. 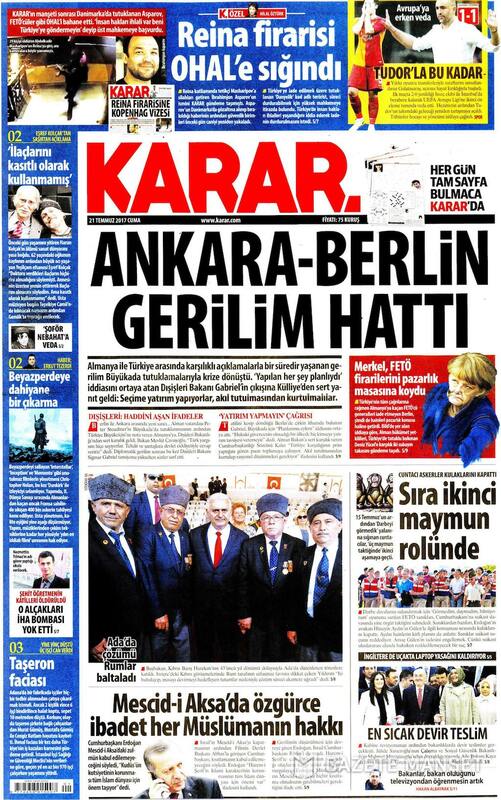 Karar Daily (below the front page), on the other hand, wrote that the reaction of the German Minister Gabriel to the arrests of the human rights activists ‘escalated the tension between the two countries that has been going on for some time’, adding that the Turkish Foreign Ministry gave a strong reaction to Germany. Yeni Akit daily, which came out with the headline(below), ‘Can’t Stand it Anymore’, added that the ‘Zionists Shed Blood Again’. The daily, referring to Israel as the ‘Zionist Dog’, accused Israel of receiving instructions from the EU and US, and accused the Arab countries of remaining silent upon the instructions of the US. It added that millions took to the streets to support Palestinians in Turkey. Pro government Sabah daily argued that Pentagon and Nato had known about the coup attempt in advance but intentionally did not share this with the Turkish government. 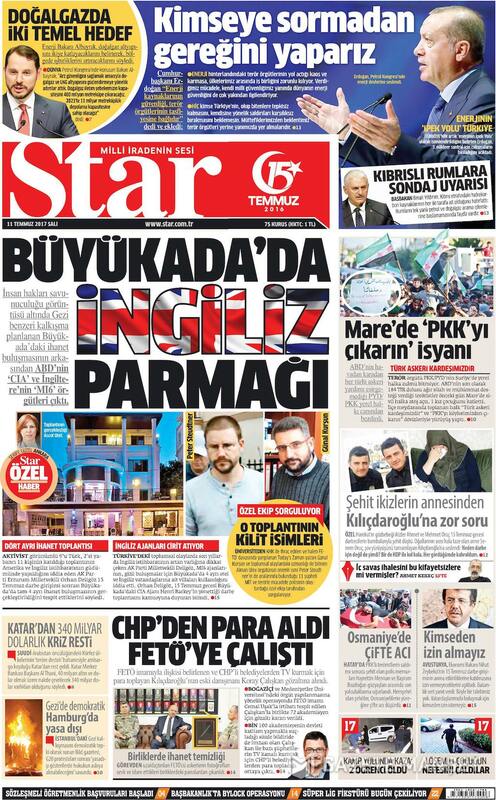 Pro government Star daily claims on its front-page, below, that those human rights activists detained in Buyukada gathered there to plot against Turkish government with the support and under the guidance of CIA and MI6. This time member of EP European Parliament) Kati Piri was the target of Erdogan’s media. Pro government Takvim daily presented Kati Piri as “supporter of the PKK and terrorists.” The news criticized Piri that she was claiming that civilians have been killed in the Kurdish dominated southeast part of Turkey. the news also denies that civilians were killed in the conflicts and claims that those who were killed during the conflicts were not civilians but PKK militias with civic clothes. Gazete Vatan suggested that an Iftar program organised by the Los Angeles based Pacifica Institute showed how the FBI and Gulenists (both perceived enemies of the Turkish state) were indeed allies. Those who voted in favour of supporting PKK affiliated protests outside the Washington based Turkish embassy have been financed by Gulenists, claims the pro-government Star newspaper. According to the press in Turkey, Minister of Foreign Affairs Cavusoglu has denied the request of a visiting German committee to Incirlik NATO base which played a pivotal role in the attempted coup on the 15th of July 2016, as there is a common belief in Turkey that foreign powers had ordered the military personnel. However, the NATO base in Konya viewed as having little significance was open to visits. On the contrary to events in the UK, in which the police had labelled the Finsbury Park terror attack as a “terrorist attack” within eight minutes of the event, the Turkish newspaper claimed the English media to be biased and discriminatory towards Muslims. The Sabah newspaper also used connotations of the crusades. Ibrahim Kalin, President Erdogan’s spokesperson states that “German intentions are malevolent”.